Although it's popular to wear sports shoes with no socks, rubbed skin and sweat-stained insoles aren’t loved by anyone. With these two pairs of BOSS Combed Cotton Plain and Stripe Trainer Socks you can make a stylish, and more hygienic, choice. You get two very wearable designs at an ankle-skimming length, topped by narrow rubbed cuffs with subtle BOSS logos. 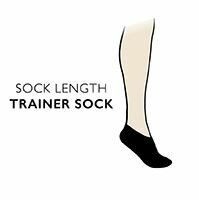 BOSS Combed Cotton Plain and Striped Trainer Socks are manufactured in a fine gauge from a high quality certified sustainable cotton rich blend, with durable reinforced stress zones and hand linked toes for smooth seams that offer pressure-free foot comfort. "72% Cotton 26% Nylon 2% Elastane "